The SD series is a pure sine wave inverter designed especially for the most demanding mobile and off-grid applications. SD series provides up to 90% of high efficiency and wide operating temperature range (from -20°C to +60°C) designed for many harsh environments. The N+X parallel redundancy framework design can greatly improve the power system's flexibility and thus the system's volume and weight are remarkable reduced. SD series features a built-in transfer switch and synchronized operation with utility AC source. 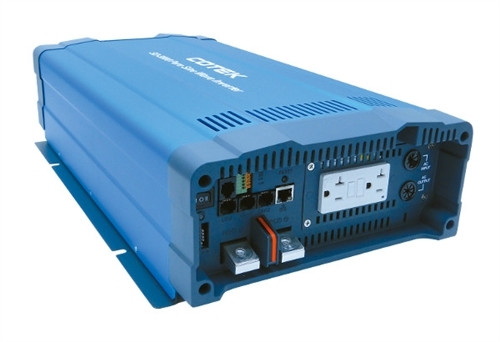 SD series can be used for N+1 (N≦14) redundancy and the ability of enlarge the capacity (Users can install maximum 15 units of inverters together in parallel in order to provide the power expansion). SD series also provides complete protection functions including Input low voltage, Overload, Short circuit, Low battery alarm, Input over voltage and over temperature. Home and office appliances, portable power equipment, vehicle, yacht and off-grid solar power systems...etc. Dimensions (W x H x D) 11.146" x 5.056" x 19.527"